Nurses that are competent in the care of a patient with cardiovascular problems are able to minimize mortality and morbidity rates for these patients. Sounds good right? In this 20-item NCLEX style exam, your knowledge about the different Peripheral Vascular Diseases will be challenged. Take it and soar high on your NCLEX! Exam Tip: Sometimes if two options are opposites (e.g., warm or cold compress), one of them is usually the correct answer. In Exam Mode: All questions are shown, but the results, answers, and rationales (if any) will only be given after you’ve finished the quiz. You are given 1 minute per question, a total of 20 minutes for this exam. Moderately impaired, and the surgeon should be called. Adequate from the arterial approach, but venous complications are arising. An expected outcome of surgery is warmth, redness, and edema in the surgical extremity because of increased blood flow. Options 2, 3, and 4 are incorrect interpretations. Stimulates the breakdown of specific clotting factors by the liver, and it takes 2-3 days for this is exhibit an anticoagulant effect. Inhibits synthesis of specific clotting factors in the liver, and it takes 3 to 4 days for this medication to exert an anticoagulation effect. Stimulates production of the body’s own thrombolytic substances, but it takes 2-4 days for it to begin. Has the same mechanism action of heparin, and the crossover time is needed for the serum level of warfarin sodium to be therapeutic. Warfarin sodium works in the liver and inhibits synthesis of four vitamin K-dependent clotting factors (X, IX, VII, and II), but it takes 3 to 4 days before the therapeutic effect of warfarin is exhibited. The mixture of arterial and venous manifestations (claudication and phlebitis, respectively) in the young male client suggests Buerger’s disease. This is an uncommon disorder characterized by inflammation and thrombosis of smaller arteries and veins. This disorder typically is found in young adult males who smoke. The cause is not known precisely but is suspected to have an autoimmune component. A client comes to the outpatient clinic and tells the nurse that he has had legs pains that began when he walks but cease when he stops walking. Which of the following conditions would the nurse assess for? Intermittent claudication is a condition that indicates vascular deficiencies in the peripheral vascular system. If an obstruction were present, the leg pain would persist when the client stops walking. Low calcium levels may cause leg cramps but would not necessarily be related to walking. Varicose veins can cause changes in what component of Virchow’s triad? Intravenous heparin therapy is ordered for a client. While implementing this order, a nurse ensures that which of the following medications is available on the nursing unit? Walking several times each day as an exercise program. The client’s instructions should include keeping the environment warm to prevent vasoconstriction. Wearing gloves, warm clothes, and socks will also be useful when preventing vasoconstriction, but TED hose would not be therapeutic. Walking would most likely increase pain. Which of the following characteristics is typical of the pain associated with DVT? DVT is associated with deep leg pain of sudden onset, which occurs secondary to the occlusion. A dull ache is more commonly associated with varicose veins. A tingling sensation is associated with an alteration in arterial blood flow. If the thrombus is large enough, it will cause pain. A nurse has an order to begin administering warfarin sodium (coumadin) to a client. While implementing this order, the nurse ensures that which of the following medications is available on the nursing unit as the antidote for Coumadin? The antidote to warfarin (Coumadin) is Vitamin K and should be readily available for use if excessive bleeding or hemorrhage should occur. Which technique is considered the gold standard for diagnosing DVT? A nurse is assessing a client with an abdominal aortic aneurysm. Which of the following assessment findings by the nurse is probably unrelated to the aneurysm? Not all clients with abdominal aortic aneurysms exhibit symptoms. Those who do describe a feeling of the “heart beating” in the abdomen when supine or be able to feel the mass throbbing. A pulsatile mass may be palpated in the middle and upper abdomen. A systolic bruit may be auscultated over the mass. Hyperactive bowel sounds are not related specifically to an abdominal aortic aneurysm. After inferior vena cava insertion, the nurse inspects the surgical site for bleeding and signs and symptoms of infection. Otherwise, care is the same as for any post-op client. Cancer can cause changes in what component of Virchow’s triad? Practice Mode: This is an interactive version of the Text Mode. All questions are given in a single page and correct answers, rationales or explanations (if any) are immediately shown after you have selected an answer. 2. Independent arterial wall activity. 4. Impairment in muscle use associated with pain on exertion. 8. Intravenous heparin therapy is ordered for a client. While implementing this order, a nurse ensures that which of the following medications is available on the nursing unit? 1. Stimulates the breakdown of specific clotting factors by the liver, and it takes 2-3 days for this is exhibit an anticoagulant effect. 2. Inhibits synthesis of specific clotting factors in the liver, and it takes 3 to 4 days for this medication to exert an anticoagulation effect. 3. Stimulates production of the body’s own thrombolytic substances, but it takes 2-4 days for it to begin. 4. Has the same mechanism action of heparin, and the crossover time is needed for the serum level of warfarin sodium to be therapeutic. 10. A nurse has the order to begin administering warfarin sodium (Coumadin) to a client. While implementing this order, the nurse ensures that which of the following medications is available on the nursing unit as the antidote for Coumadin? 3. Moderately impaired, and the surgeon should be called. 4. Adequate from the arterial approach, but venous complications are arising. 4. Has brown pigmentation around it. 1. Walking several times each day as an exercise program. 14. A client comes to the outpatient clinic and tells the nurse that he has had legs pains that began when he walks but cease when he stops walking. Which of the following conditions would the nurse assess for? 15. Which of the following characteristics is typical of the pain associated with DVT? 16. Cancer can cause changes in what component of Virchow’s triad? 17. Varicose veins can cause changes in what component of Virchow’s triad? 18. Which technique is considered the gold standard for diagnosing DVT? 19. A nurse is assessing a client with an abdominal aortic aneurysm. Which of the following assessment findings by the nurse is probably unrelated to an aneurysm? 4. Subjective sensation of “heart beating” in the abdomen. 3. Bleeding and wound dehiscence. 4. Wound dehiscence and evisceration. 9. Answer: 2. Inhibits synthesis of specific clotting factors in the liver, and it takes 3 to 4 days for this medication to exert an anticoagulation effect. 12. Answer: 4. Has brown pigmentation around it. Venous leg ulcers, also called stasis ulcers, tend to be more superficial than arterial ulcers, and the ulcer bed is pink. The edges of the ulcer are uneven, and granulation tissue is evident. The skin has a brown pigmentation from the accumulation of metabolic waste products resulting from venous stasis. The client also exhibits peripheral edema. The client’s instructions should include keeping the environment warm to prevent vasoconstriction. Option A: Walking would most likely increase pain. Option C: Wearing gloves, warm clothes, and socks will also be useful when preventing vasoconstriction, but TED hose would not be therapeutic. Intermittent claudication is a condition that indicates vascular deficiencies in the peripheral vascular system. Option A: If an obstruction were present, the leg pain would persist when the client stops walking. Option D: Low calcium levels may cause leg cramps but would not necessarily be related to walking. DVT is associated with deep leg pain of sudden onset, which occurs secondary to the occlusion. Option A: A dull ache is more commonly associated with varicose veins. Option C: If the thrombus is large enough, it will cause pain. Option D: A tingling sensation is associated with an alteration in arterial blood flow. Not all clients with abdominal aortic aneurysms exhibit symptoms. Option A: A pulsatile mass may be palpated in the middle and upper abdomen. Option C: A systolic bruit may be auscultated over the mass. Hyperactive bowel sounds are not related specifically to an abdominal aortic aneurysm. Option D: Those who do describe a feeling of the “heart beating” in the abdomen when supine or be able to feel the mass throbbing. 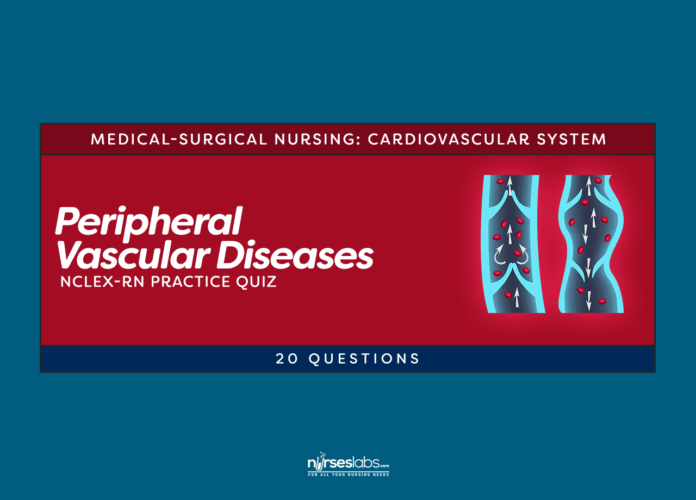 3,500+ NCLEX-RN Practice Questions for Free – Thousands of practice questions for different nursing concepts and topics to help you review for the NCLEX-RN. Nursing Exam Cram Sheet for NCLEX-RN – This downloadable guide contains condensed facts about the licensure exam and key nursing information. 20 NCLEX Tips and Strategies Every Nursing Students Should Know – Simple but effective tips you must know before you take the NCLEX or our exams. My NCLEX Experience: Study Tips and Resources for Nursing Students – Get personal and learn more review and exam tips in this article. 6 Easy Ways on How Nurses Can Master the Art of Delegation – Make delegation easier with these six strategies. 8-Step Guide to ABG Analysis: Tic-Tac-Toe Method – Know this trick in answering ABG Analysis questions! 5 Principles in Answering Therapeutic Communication Questions – How would you respond correctly when facing a theracom question? We break it down for you in this article. 12 Tips to Answer NCLEX Select All That Apply (SATA) Questions – There are tricks on how to tackle SATA questions, check them out in this article. 10 Effective NCLEX Test Taking Strategies and Tips and 11 Test Taking Tips & Strategies For Nurses – More tips on how to pass your licensure exam! 10 Brilliant Tips to Overcome Test Anxiety – Do you have test anxiety? Yes, it's a thing. Know more about overcoming it with this guide. The answer in no. 15 is sudden onset but the one here is tingling pain.